Food is not just to satiate hunger, it is meant to be enjoyed and when it is part of an occasion, it should be a memorable experience. Not everybody understands the significance of a tantalizing but healthy meal, but at Sac Tacos, we do. We take it upon ourselves to provide you an awesome and delicious catering experience. For all Rocklin residents, your occasions would be lacking the basic successful ingredient without an excellent catering service, the likes of which we provide at Sac Tacos. Sac Tacos is a family-run catering service company that specializes in a wide assortment of traditional Mexican dishes. A favorite Rocklin Catering Service for many years, Sac Tacos is an authentic catering business run by a Mexican family that understands the importance of family and the uniqueness of your celebrations, we go all out to make your celebrations talk of the town while you sit back and just enjoy our catering ride. Sac Tacos believes in memorable catering services from our family to yours. Our catering experience spans over two decades with renowned world-class chefs and other capable catering staff. Whatever Rocklin catering dreams you come up with, we are willing and able to bring them to perfect reality for you. We create not just amazing dishes; we also package and serve them in excellent manner that will attract even the sick to eat. With highly trained caterers and beautiful wares, Sac Tacos meals appeal to your appetite. We have a knack for style, class and variety in our catering services. Each event is treated as a unique occasion deserving a unique impression, appearance and taste. 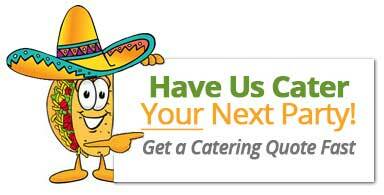 Buffet catering including carnitas platter special, breakfast buffet, and the subsidized Taco Tuesday specials. We can customize your menu for you any way you want it, we place no restrictions on the menu selection. Please visit our catering menu section for more on our menu and other services or download our catering menu. These will assist you greatly in planning and creating the perfect event.